Our busy summer season is extending into October with a full range of experiences scheduled, including Tiger Moth, Harvard, Spitfire and Fly With Formation Flights. 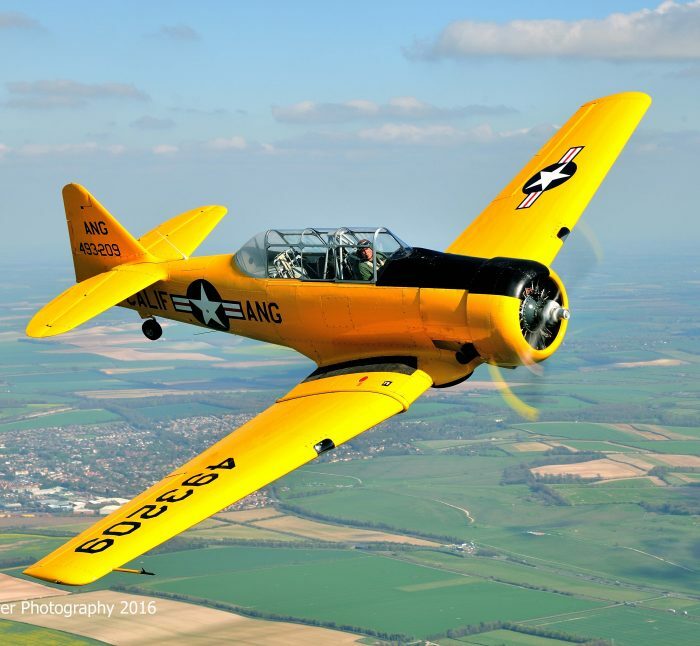 We are excited to make 17th to 19th October available at Headcorn Aerodrome, where all new Spitfire flight bookings will include a formation flight in a North American T6 Harvard free of charge. 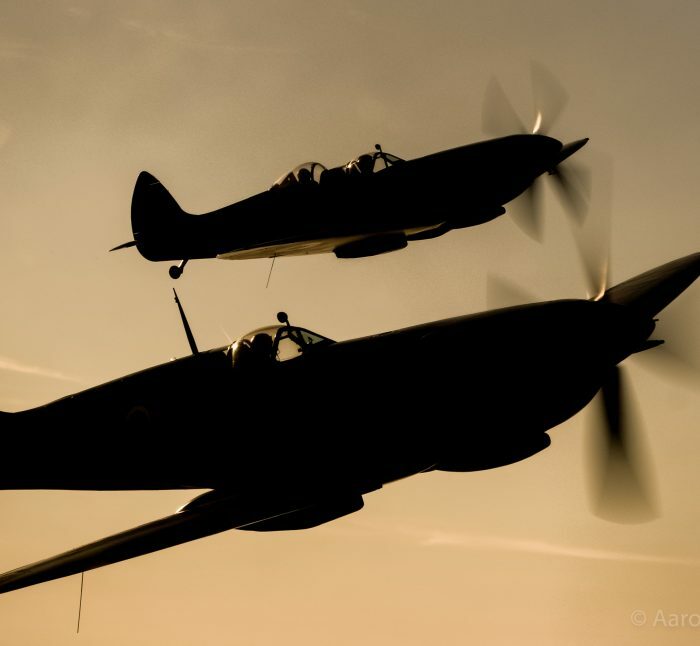 The formation flight enables a guest to share in the experience, flying alongside your Spitfire and photographing you in flight. As well as enjoying the thrill of close formation with a Spitfire before you peel away to patrol the White Cliffs of Dover, your guest will be given the opportunity to take control or even perform some gentle aerobatics. The Harvard was the advanced trainer on which almost all Spitfire pilots would’ve been trained, affectionately known as the ‘pilot maker’. Equipped with a 600hp radial engine and retractible undercarriage, it was much more like a fighter aircraft than any other trainer. The large elevated canopy offers great visibility, meaning unobstructed views out of the cockpit while soaring in formation though Kents famous Battle of Britain airspace. To fly in formation with another aircraft is a once-in-a-lifetime experience, to fly in a formation of warbirds makes it immeasurably better. Especially when your Spitfire is piloted by Flt Lt Antony ‘Parky’ Parkinson MBE with his abundance of formation and flying display experience. 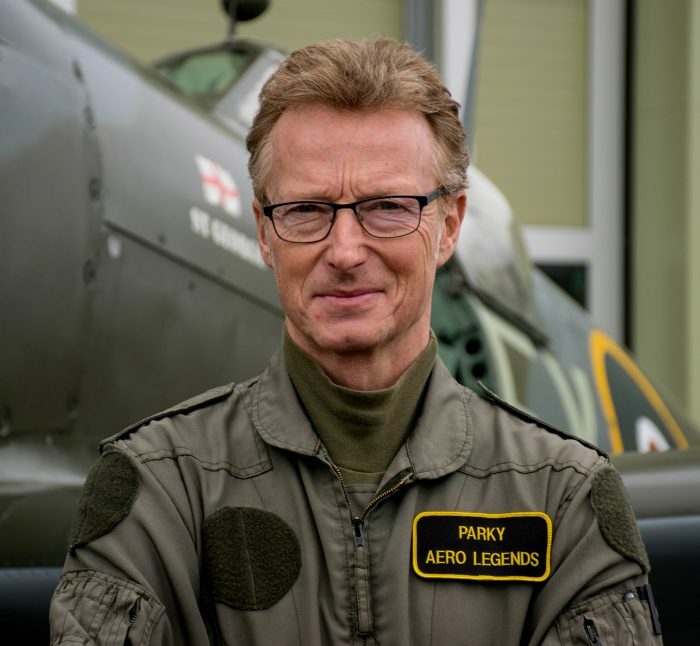 Parky became the first pilot to gain 1000 hours flying the Euro Fighter Typhoon and has also flown over 1000 hours on the F4 Phantom and the Tornado F3 for which he was the display pilot in 2000 before joining the Red Arrows for the 2001 to 2004 seasons flying the Hawk. Parky also flew the F16 for 3 years with the Royal Netherlands Air Force and has 7000 flying hours in total. Parky flew with the Battle of Britain Memorial Flight from 2007 to 2018 as one of the fighter pilots and has just exceed 800 Spitfire hours with Aero Legends. To book your experience, contact our team at info@aerolegends.co.uk or 01622 812830.